Guaranteed to keep APX high up the stage-electro charts. Knock-out performance for the money. Close bridge string spacing. Non-muting onboard tuner. The APX comes in a wider range of colours. The APX50011 is an entry-level winner. The laminated spruce/nato finish is attractive. Since their introduction nearly 25 years ago, Yamaha's APX stage electros have undergone periodical revamps and 2011 sees another stage in the evolution in the shape of the APX500II. The PP3 9V battery has been replaced by two 1.5V AAs and within the circuitry, Yamaha has somehow managed to boost the batteries' voltage to 11V to give, it says, a wider dynamic range, more stable operation and reduced distortion, even when the batteries are running low. "Despite being the entry-level model this laminated spruce/nato guitar is attractively decked out." In short, the claim is better tone for longer: no bad thing at all. Presumably a spin-off benefit is that rechargeables can be used - as long as they're alkaline - so you won't need to keep forking out for batteries. There's also a new piezo under-saddle pickup. Rather than a single, narrow ribbon, this comprises six individual elements on a wider strip that, says Yamaha, offers improved clarity, definition and balance. The preamps retain their predecessors' facilities of a three-band EQ and wide-range mid contour, but the control panels have been physically redesigned, and the EQ is said to have been "reviewed for optimum sound and balance". The auto-chromatic tuner, with a new, clearer display, is apparently now more accurate (though we don't recall a problem with the old one), but they still don't mute the output when engaged. For discreet mid-performance tuning tweaks this is a significant omission. As for cosmetics - extended colour choice aside - the main changes are a black-faced headstock and truss rod access via the soundhole. Despite being the entry-level model this laminated spruce/nato guitar is attractively decked out. The all-over gloss red metallic finish - one of the new colours - is very well applied and buffed, aside from a small length of imperfect edging next to the cutaway's purfling, while the grain lines indicate that the lacquer hasn't been sprayed on too thickly. The rosewood fingerboard is edged in body-matching cream plastic binding and, like all APX and CPXs, there's a second strap button at the heel. In common with all steel-strung, six-string APXs, the span across the nut is 43mm, while the nato neck has a moderate-depth 'C' profile with just the hint of a 'D' along the shoulders, and width graduates only modestly further up. Aided by a fine set-up, well-dressed fretting and a shorter 634mm scale length, this is eminently playable and comfortable, yet bridge string spacing is perverse. As opposed to the APX norm of 53mm, our sample's is barely 50mm, harking back to eighties FGs. Fingerstyle isn't out of the question, but there's no denying the spacing feels restrictive. Yamaha evidently reckons most buyers will be strummers, which may or may not prove true. The guitar is a decidedly capable performer. 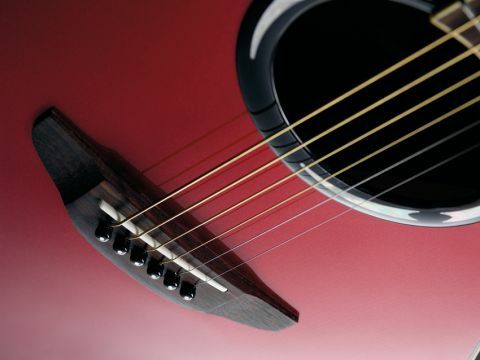 Acoustic volume, if not blastingly loud, is up to par for the body size, with reasonable dynamics and sustain, and the tone is smooth and fluid with an agreeable degree of lower-end warmth and sweet-edged highs. Powered up, the new pickup clearly pays dividends. There's not a hint of piezo 'quack', the whole delivery sounds natural, flowing and open, and the wide-range AMF mid contour helps realise an impressively broad tonal palette without ridiculous extremes. The icing on the cake is the system's decent gain and spot-on cross-string output balance.